Are you a fan of cilantro? Because I know not everyone is. We, however are proud members of Team Cilantro. We add bunches of it to Asian dishes and Mexican dishes and often use it to garnish salads and salsas. Combine all ingredients in a large bowl; stir well. Season with salt and pepper. Add 3 tablespoons of olive oil to a large skillet set over medium heat. When the oil gets hot, add spoonfuls of the black bean mixture. Fry on one side until golden brown and crispy, about 3 minutes. Flip over and fry for an additional 3 minutes. Remove and drain on a paper towel. Season with more salt and pepper. Serve over sweet potato salad. Preheat the oven to 400°F. Scatter the sweet potatoes onto a roasting pan, drizzle with olive oil, and season with salt and pepper. Roast in the oven for 20-30 minutes until slightly crispy. Toss roasted potatoes with red bell pepper, jalapeno, scallions, and cilantro. Finish with lime juice and another drizzle of olive oil. Season with salt and pepper and serve with black bean patties. I’m not a cilantro fan, so substitute fresh parsley in recipes like this and it’s works well! I’m definitely on Team Cilantro. 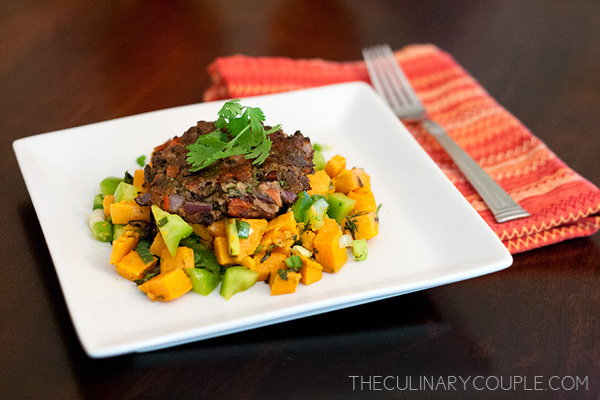 This sounds awesome, especially the sweet potato/cilantro combo!